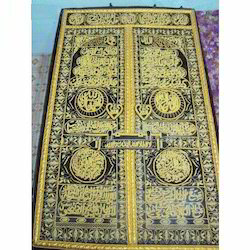 Offering you a complete choice of products which include arabic design wall panel hangings, jewel embroidery wall panel hangings, hand embroidered islamic wall hanging, flowered hand embroidery wall hanging, zari embroidery wall panel hangings and zari embroidery wall hanging. 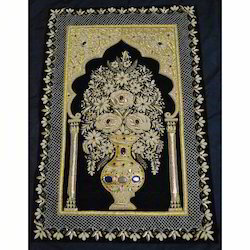 We are engaged in offering Hand Embroideries that are used to manufacture traditional Arabic Design Wall Panel. This array of These Arabic Design Wall Panel is crafted using hand-made zari embroidery and other high quality material. We make this wall panel available in a wide variety having different styles and patterns, so as to meet the particular needs of our clients. Designed in line with the specific clients’ requirements, these products are available at market leading prices. 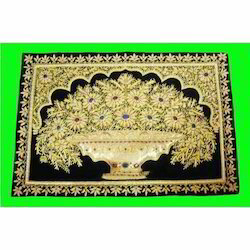 We bring forth a wide range of hand made Jewel Embroidery Wall Panel which are available in different posters, sizes and colors. 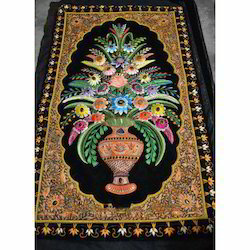 We take immense care to design these handmade embroidery wall panel using high quality raw material. 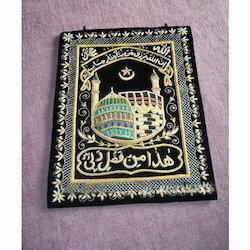 With the help of our talented craftsmen, we are able to manufacture, supply, wholesale and export our range of Hand Embroidered Islamic Wall Hangings. These finely crafted works of art are made from high quality fibers that are carefully handmade to create unique and magnificent pieces of creations. We use various combination's of colors and patterns that show the amazing authentic influence of Islamic culture. These give the elegant and stylish appeals that are have timeless appeal. 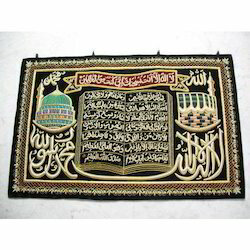 Our Hand Embroidered Islamic Wall Hangings are available at very reasonable range of prices. 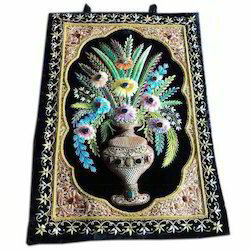 We are Prominent manufacturer for these Flowered Hand Embroidery Wall Hangings Offering Pure Silk Embroidery Handicrafts for Home Furnishing. 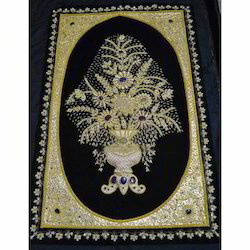 We produce Flowered Hand Embroidery Wall Hangings with Precious Stones, Pure Zari, Pure Silk. 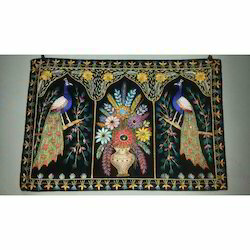 Wall Hanging Sceneries, Ladies Purses, Christmas Hangings, Silk Hand Embroidery Animals, Flower Vases etc. We can draw any Customized item as per Sample, Drawing, Sketches etc. Our products exhibit the rich workmanship of our experienced craftsmen. With our in-depth industry experience and knowledge, we are engaged in offering our clients a wide collection of Zari Embroidery Wall Panel. Our provided wall panel is crafted with hand-made zari embroidery and other high quality material. As well, this wall panel is well checked by our quality controllers on diverse parameters for delivering perfect range. Our valuable customers can avail this wall panel in committed time frame in numerous designs & sizes. 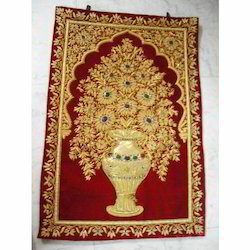 Along with our line of high quality products is our Zari Embroidery Wall Hangings that we manufacture, supply wholesale and export. 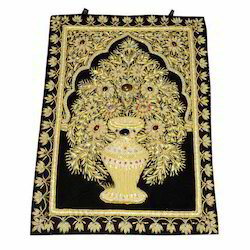 These intricately designed wall hangings are widely demanded due to its exclusive designs and durability. 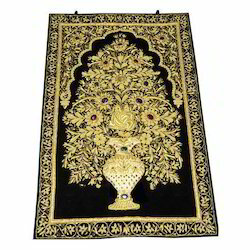 Our embroidered wall hangings are made by well experienced and talented craftsmen that dedicated to provide world class work of art. 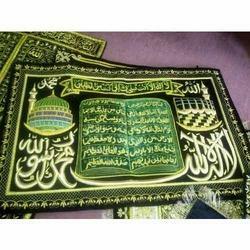 These wall hangings have superior finishing that will last for long time. These are available in different colors and designs at very economical range of prices. 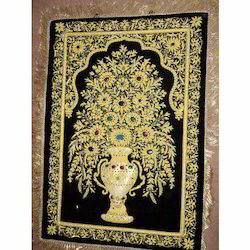 We offer a wide range of Hand Embroidery Wall Panel that is available in different designs, sizes and colors. The fine zari embroidery is done by highly creative artisans, who bring out exclusive designs. Our zari embroidery wall panels are handmade and light in weight. Best quality zari and other materials used in the creation of these decorative pieces lead to their long-lasting finish and quality. With rich industry experience and knowledge of our professionals,we have positioned ourselves as an eminent supplier and trader of a wide assortment of Embroidery Flower Wall Panel. This lovely design is printed onto pure cotton, ready to embroider. Ideal for ribbon or creative embroidery, stumpwork or crewel embroidery, card making, or to use in your quilt. Use your own creativity to make a lovely heirloom. A great gift idea! This array of Jewel Wall Hanging Panel Decorative is crafted using hand-made zari embroidery and other high quality material. We make this wall hanging available in a wide variety having different styles and patterns, so as to meet the particular needs of our clients. Designed in line with the specific clients’ requirements, these products are available at market leading prices. For meeting diverse requirements of our prestigious clients, we offer an extensive range of Handcrafted Jewel Wall Panel Hangings. These products are broadly used in homes, offices & many places to decorate walls. Our offered range can be availed from us in a variety of designs, patterns & sizes. Such a wide range helps to beautify the surroundings as well. These wall panels are precisely designed by our skilled designers keeping in mind the latest trend. 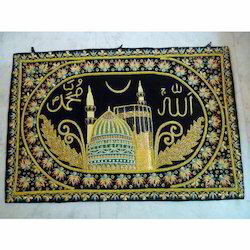 We are a well-known company, engaged in offering an exclusive collection of Arabic Design Embroidery Panel. The offered embroidery panel is designed by our competent workforce using modern techniques in accordance with the market trends. Famous for their traditional appearance, these Panels are used as a perfect match for the various home decors. 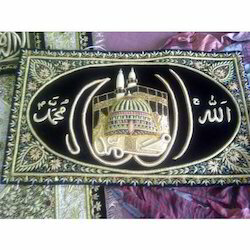 Our customers can avail this embroidery panel from us at market leading rates within a given time frame. The sparkling Zardozi embellishments in gold work will lend a spectacularly ethnic look and add style to your room. Transform your table, floor or wall with the royal grandeur of Indian culture.This is a great gift for a loved one and a genuine Collector's item. Never seen in any major departmental store, this is a rare find & a true treasure. With consistent focus on quality, our company is engaged in offering a qualitative Designer Zari Embroidery Wall Panel Hangings. This product is appreciated for its premium quality and perfect finish. The offered product can be obtained in varied modified options to choose from. Our product is fabricated using quality approved raw material in order to maintain its compliance with universally accepted standards. This panel can be purchased from us at industry leading prices. 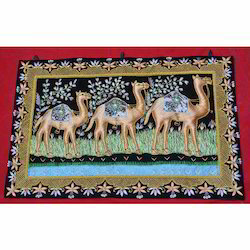 This array of Hand Embroidery Arabic Wall Hanging is crafted using hand-made zari embroidery and other high quality material. We make this Wall Hanging available in a wide variety having different styles and patterns, so as to meet the particular needs of our clients. Designed in line with the specific clients’ requirements, these products are available at market leading prices. 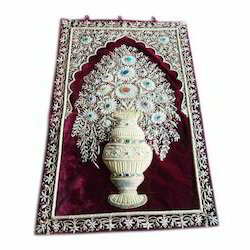 We are known as one of the leading manufacturers, exporters and suppliers of a vast gamut of Kashmiri Handcrafted Jewel Carpet. 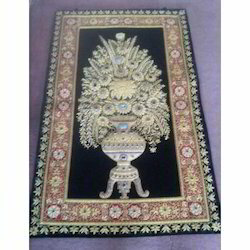 By using premium quality velvet base, these Carpets are made from zari gold material. Our offered carpets can be availed in different sizes, stylish patterns, appealing painting work, smooth texture, multiple designs, shapes, durable nature and worth praising prints. 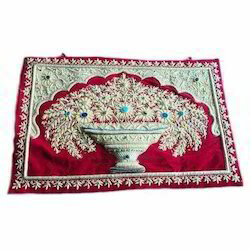 These Kashmiri Handcrafted Jewel Carpets are used to enhance the decor of homes, restaurants, corporate offices, hotels and many other establishments. 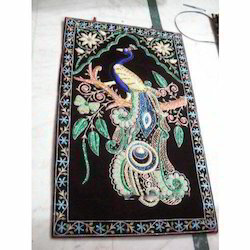 With enriched industrial experience and knowledge, we are providing an excellent range of Hand Embroidered Peacock Wall Hangings to our patrons. 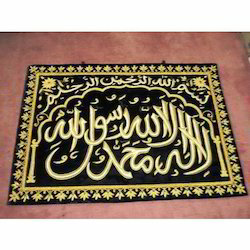 Designed with utmost precision, the offered wall hanging is designed using high grade material and advanced technology. In addition to this, our products undergo various tests under the supervision of quality controllers to ensure its flawlessness. 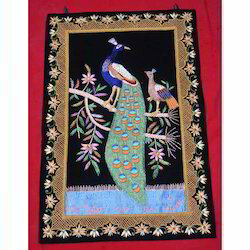 Clients can avail these Hand Embroidered Peacock Wall Hangings from us at market leading rates. Our organization hold expertise in providing superior grade Hand Embroidery Wall PanelsHangings Wall Hanging to our precious customers. 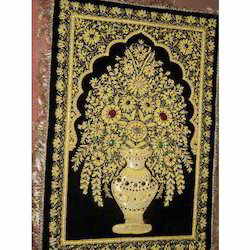 Our offered Hand Embroidery Wall Panels is widely appreciated by our customers, which are situated all round the nation. 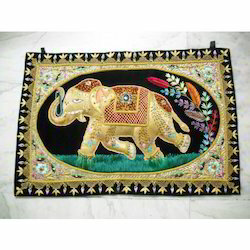 Known for its best quality, clients can avail this Zari Hand Embroidered Elephant Wall Hanging at industry leading prices from us. 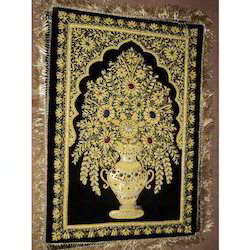 Our Hand Embroidery Wall Panel Hangings is crafted using hand-made zari embroidery and other high quality material. We make this wall hanging available in a wide variety having different styles and patterns, so as to meet the particular needs of our clients. Designed in line with the specific clients’ requirements, these products are available at market leading prices. 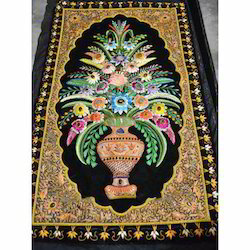 We are regarded as the well known manufacturer and supplier of the Zari Embroidery Wall Carpet. Known for its appealing hand work, the offered wall panel is made at our end using best tools & material by our skilled professionals. This wall panel is provided in various options as per the need of customers. Our wall panel widely demanded due to its elegant designs and flawless finishing. We are one of the prominent organization, engaged in offering an excellent assortment of Jewel Stone Wall Panel Handcrafted. 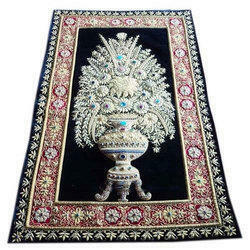 These offered are made by making use of Zari and Resham with 100% hand embroidery. This range of Jewel Wall Panel is offered in various sizes, designs and colors in order to cater the varied specifications of our valued clients. Furthermore, our professionals do tree and floral embroidery work on these Jewel Wall Panel, which make them look more elegant. These Wall Panels are appreciated for their striking patterns and intricate designs. We offer a wide range of Zari Embroidery Wall Panels that is available in different posters, sizes and colors. The fine Zari embroidery is done by highly creative artisans, who bring out exclusive designs. Our Zari embroidery Wall Panels are handmade and light in weight. Best quality Zari and other materials used in the creation of these decorative pieces lead to their long-lasting finish and quality. With years of industrial experience in this industry, we are involved in offering an exclusive Jewel Wall Panel Hangings. This product is fabricated using latest techniques and optimum quality raw material in order to maintain its adherence to universally accepted standards. Besides this, the offer qualitative range is tested by our quality controllers on various parameters in order to ensure its perfect finish. Moreover, our product is vastly demanded in domestic and international markets. We take pleasure in introducing ourselves as one of the leading manufacturers and suppliers of Arabic Design Embroidery Panels. This embroidery panel is designed with precision employing creative techniques in fulfillment with the trends of market. 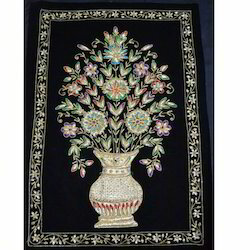 Our given embroidery panel is offered in different sizes, designs, colors and patterns to accomplish the variegated expectations of our esteemed customers. Along with that, we provide this embroidery panel after checking on different parameters before supplying to customers. Beautiful rare large colorful Zari Embroidery Wall Hanging of Indian Art. This breathtaking Indian Zari Embroidery Wall Hanging will not only add warmth and color to your home, but will also add a huge dose of cultural history, are carefully shown together to produce and magnificent collage. 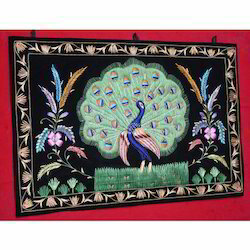 This Zari Embroidery Wall Hanging will breathe life in your living room and Office. This array of Patchwork Embroidery Wall Hanging is crafted using hand-made zari embroidery and other high quality material. 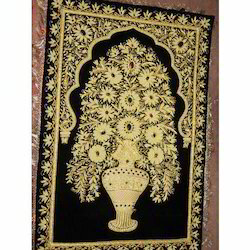 We make these wall hanging available in a wide variety having different styles and patterns, so as to meet the particular needs of our clients. Designed in line with the specific clients’ requirements, these products are available at market leading prices. Over the years, we have dominated the market with our Zari Emboidery Wall Panel. We have been offering the range in various styles, designs, colors and dimensions to suit the different requirements of the clients. Our Zari Emboidery Wall Panel is designed from quality approved materials, as per the prevailing market trends. In addition, our hangings are easy to mount on the wall and are easy to clean. We offer a wide range of Peacock Design Jewel Wall Panel that is available in different posters, sizes and colors. The fine zari embroidery is done by highly creative artisans, who bring out exclusive designs. Our zari embroidery wall panels are handmade and light in weight. Best quality zari and other materials used in the creation of these decorative pieces lead to their long-lasting finish and quality. 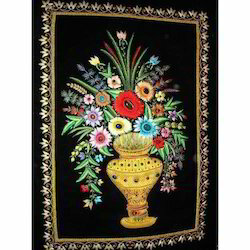 We offer a wide range of Zari Hand Embroidery Wall Hanging on Velvet and these have Flower-Vase designs mostly. Hand-needle work on velvet in these Zari Embroidery Wall Hangings makes is exceptional and the traditional designs & patterns extend it a gorgeous look. The dexterous embroidery in multi-shaped patterns enhances the look of these wall hangings. Moreover, these add beauty and majestic looks to the interior. These are also customized on the basis of designs and patterns. These are available in in all standard sizes. This array of Jewel Embroidery Arabic Wall Hangings is crafted using hand-made zari embroidery and other high quality material. 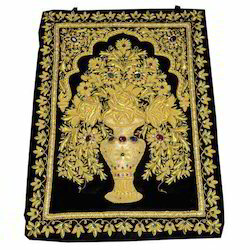 We make this Jewel Embroidery Arabic Wall Hangings in a wide variety having different styles and patterns, so as to meet the particular needs of our clients. Designed in line with the specific clients’ requirements, these products are available at market leading prices. In order to satisfy diversified demands of our clients, we are offering a vast assortment of Zardosi Jewel Wall Panel Hangings. The offered products are widely appreciated and accepted for their eye-catching designs and alluring look by our valuable clients spanning all over the world. These products are broadly demanded in domestic as well as international markets. In addition to this, our products can be purchased at industry leading rates within a stipulated periods of time. 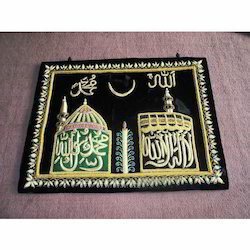 We presents a stunning Islamic Mecca Madeena Wall Hangings in classic hand embroidered design style. Exquisite & intricate hand embroidery done by the craftsmen & embroiderers of Kutch using silk, linen & cotton threads. Beautiful & detailed gold wire embroidery too for the extra shimmer. We are looking for export inquiries from worldwide. With the help of our team of adroit professionals, we have become a reliable manufacturer and supplier of Antique Wall Panel Hanging. The offered wall panel is designed with modern techniques in fulfillment with set standards. This wall panel is provided in quality packing in order to ensure its defect free supply during transit. Moreover, we are providing our wall panel in different sizes & customized options to meet the varied demand of clientele. Our industry expertise enables us to offer a comprehensive Kabba Door Arabian Panel to our clients. Besides being fabricated using high grade raw material by our professionals, these Kabba Door Arabian Panels is meticulously tested on numerous well defined parameters to ensure its perfect finish and premium quality. Our offered product can be acquired in modified options that draw the attention of our esteemed clients spread all over the world. These are available in various sizes and designs. Assisted by a team of highly skilled professionals, we are manufacturing, exporting and supplying a comprehensive spectrum of Colourfull Jewel Wall Panels.Besides being fabricated using superior quality raw material by our professionals, these wall panels are meticulously tested against numerous quality parameters to ensure their perfect finish. Our offered products can be acquired in customized options that draw the attention of our esteemed clients spread all over the world. 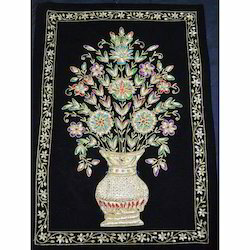 For our valuable clients, we bring forth an excellent Embroidered Jewel Wall Panels. 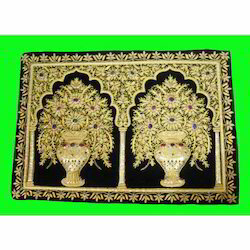 These Embroidered Jewel Wall Panels is fabricated by our professionals, utilizing updated technology and utmost grade raw material, following set universal industry norms. Our clients greatly appreciate the offered product for its excellent finish and eye-catching pattern. In addition to this, our product can be purchased at industry leading rates within a stipulated periods of time. 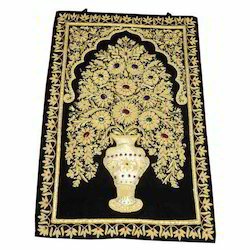 We offer a wide range of Arabic Jewel Wall Hangings that is available in different designs, sizes and colors. The fine zari embroidery is done by highly creative artisans, who bring out exclusive designs. 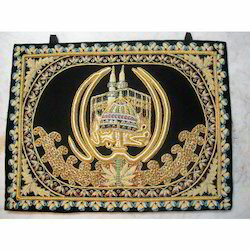 Our Arabic Jewel Wall Hangings are handmade and light in weight. Best quality zari and other materials used in the creation of these decorative pieces lead to their long-lasting finish and quality. With years of experience and expertise knowledge, we provide Jewel Wall Panel Hanging to our customers. This Wall Panel is highly demanded for various interior decoration and construction industries. Our product is well known for its excellent design, light weight and easy to clean features. 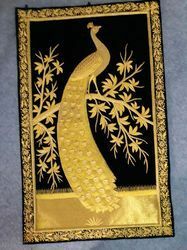 Empowered by our levels of exquisite professionals, we are involved in offering a wide gamut of Hand Embroidered Wall PanelHangings. These products are fabricated using latest techniques and optimum quality raw material in order to maintain their adherence to universally accepted standards. In addition to this, the offer qualitative products are tested by our quality controllers on various parameters in order to ensure their optimum quality. Looking for Zari Embroidery Wall Panel ?